Molly previously served san activist and organizer for Occupy Bernal, a neighborhood group focused on fighting evictions in Bernal Heights. She’s currently working on a book about the history of women construction workers in the Bay Area. We met Molly after she pitched her story to us via email. 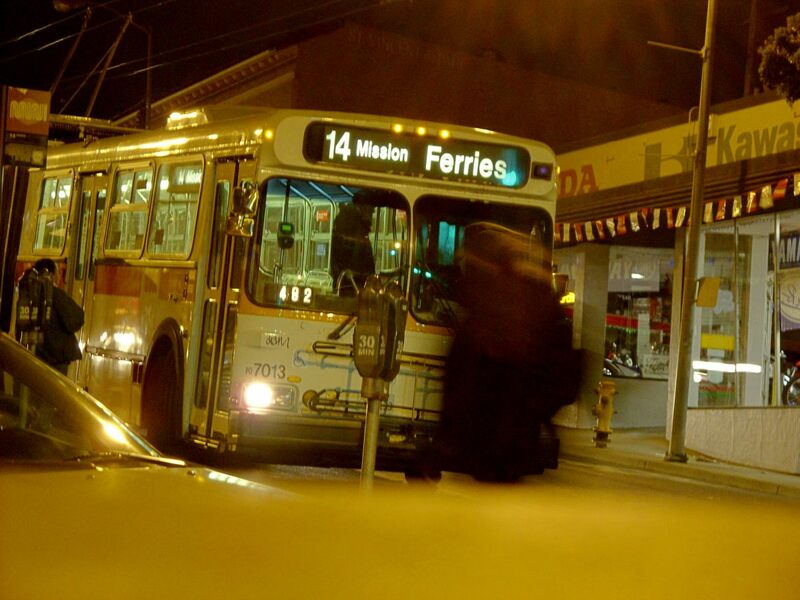 Be cool like Molly and pitch your own Muni or San Francisco story at muni.diaries.sf@gmail.com. 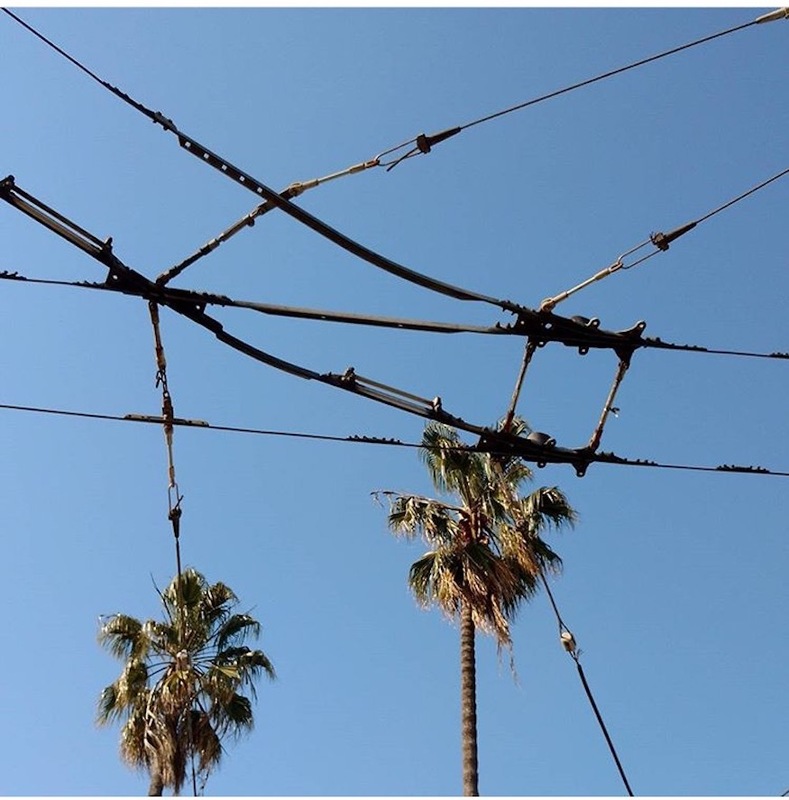 And if you like what you’re hearing, help us keep the lights on at Muni Diaries HQ by supporting us on Patreon. By the looks of it, this is a brand-spanking new bed — and a very lucky pooch. 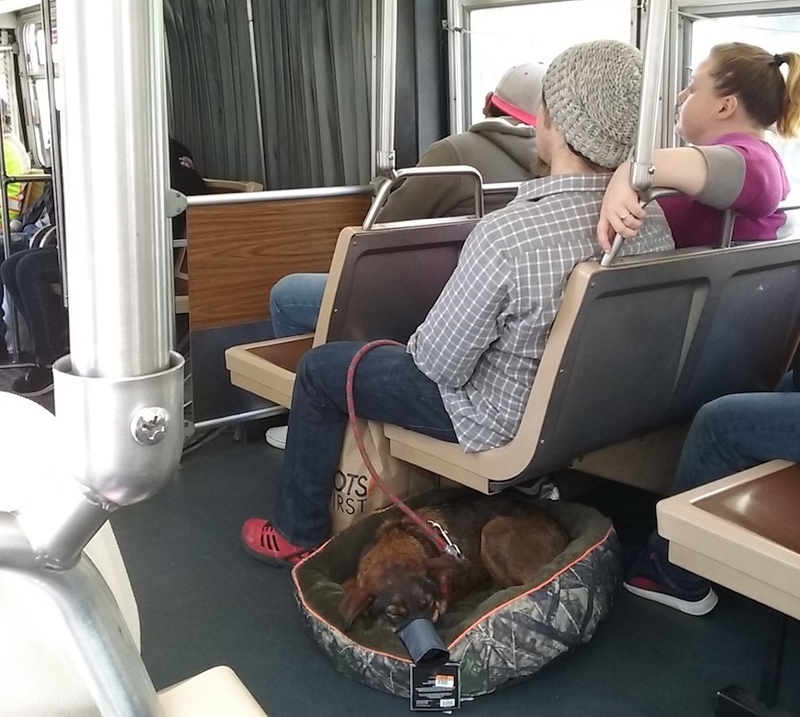 Hats off to these dog owners for creating a jealously comfortable Muni ride for their pet. 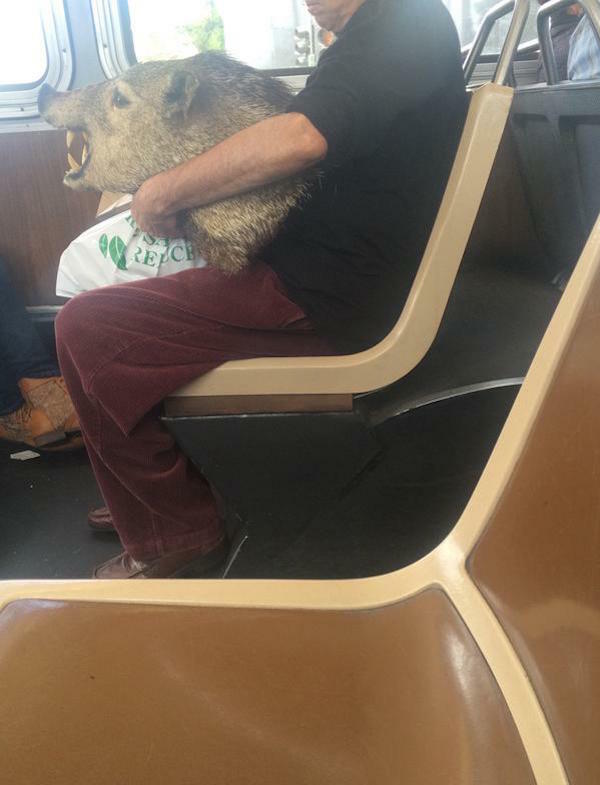 The Muni menagerie never disappoints — so much so, we have a whole category teeming with odes to the four-legged, the feathered, and even the scaly that have joined humans on our adventures through town. h/t to sender-inner James Robinson. Wanna be cool like James? Tag us on Facebook, Instagram, or Twitter with the haps on your bus. Plus, our email inbox, muni.diaries.sf@gmail.com, is always open! At Muni Diaries HQ, we like to say that Muni is our collective living room because it is such a constant part of our every day. Though some things are better done in your actual living room, not everyone got the memo. Rider Dave sent us a story of one such example involving a useful hand mirror. The Scene: the 14 just past 16th/Mission headed downtown. A little old lady gets on the bus and sits down next to me. I am minding my own business reading a book on my phone. Every now and then I notice a slight flash to my left. I glance over and see she’s holding a small hand-mirror. I figure she’s putting on her make-up or something,… whatever. The flashing keeps happing and I look over again and saw that she’d hiked up her dress, wasn’t wearing any underwear and the flashing (so to speak) was her periodically using the mirror to examine her private bits. I felt simultaneously like my breakfast was going to come up, and so relieved that my life is not nearly as messed up as what I was witnessing. I figure the rest of my day will probably pretty tame, no matter what. In her defense, haven’t you sometimes really needed to know if you have spinach stuck between your teeth, whether that awful zip popped, or whatever? Resist the urge, everyone. It can most likely wait! Photo by our own Tara Ramroop. You guys just can’t stop with the Muni <3, can you? WonderlandSF sells these bad boys, and says they still have some available. My birthday is right around the corner, you know? Here’s a video of the pinewood derby cars racing at the Wonderland store. Wonderland is on 1266 Valencia between 24th and 23rd, so you can go and check it out for yourself. 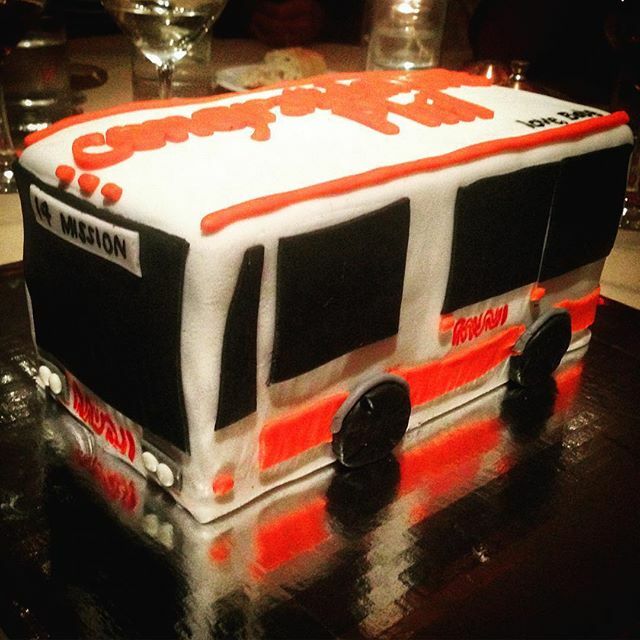 Philip just passed his class B license test for Muni, and his wife and friends surprised him with this custom Muni cake. The 14-Mission looks pretty good in fondant, and who knows what stories lie beneath those tinted frosting windows!